The Great Backyard Bird Count has come and gone. We finally had two days where the temperature got into the 40s and the sun was shining. Hope your week was as good as ours. 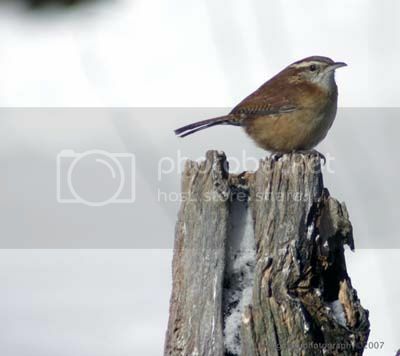 Carolina Wren - I know I showed this bird last week, but this picture is so much better than the one I used then. 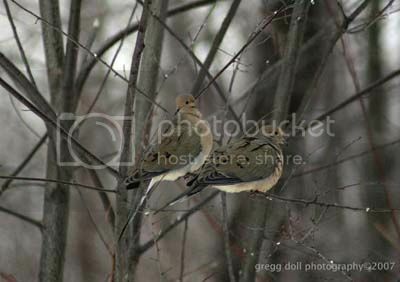 Most of the bird pictures in this week's issue were done during the Great Backyard Bird Count, this past weekend. One of the birds that are here all year round are the doves. 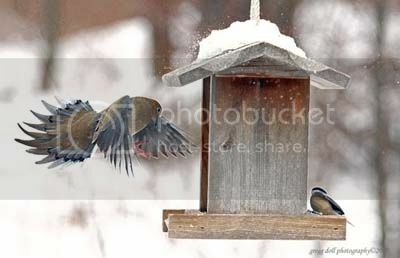 I got this one just as it jumped off the top of the feeder. The picture was done as a watercolor using PhotoShop. These photographs are all the result of timing, hand-eye coordination and just plain dumb luck. A Female Downy Woodpecker sets up for her landing on the suet feeder. Our first red squirrel of the year. These squirrels, the smallest of the tree squirrels, seldom come down this close to the house. Getting the composition is the easiest part of taking bird pictures, especially the ones that show action. Once I have the shot setup as I want it, I sit and wait for the birds to come into the box. This picture took about twenty minutes to get. Much like being in the Marine Corps, hurry up and wait. 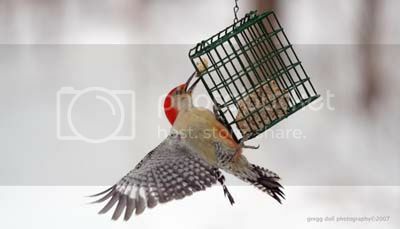 Of all the pictures that I shot during the GBBC, this one of a Red-Bellied Woodpecker, is probably my favorite. 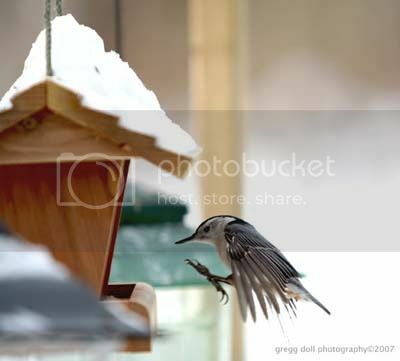 If you look at the leg/foot in the foreground, you can see that the bird just released it's grip on the feeder, has it wings in motion and is about to take off with it's beak full of suet. Two of the nine doves that we counted sit in a tree about ten feet off the ground. 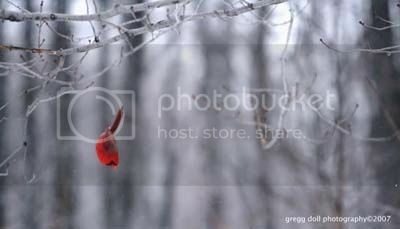 Diving straight down off of it's perch, this male Northern Cardinal, heads for the feeder, eight feet below. 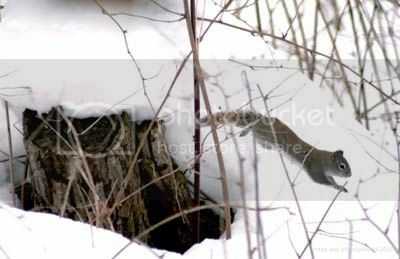 Having a hunter's background helps when it comes to getting the best action shots of moving birds and animals. Remember, you've got to lead your target. Here is a bird of a different sort. This one works for the Pennsylvania Department of Transportation and does windows. 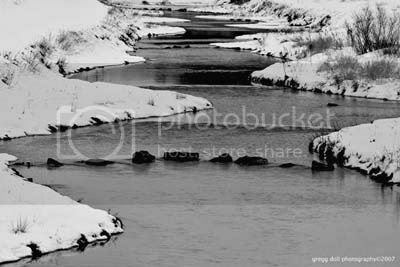 The black and white aspects of this photograph make the Chest Creek at Patton look a bit ominous on a cold winter morning. 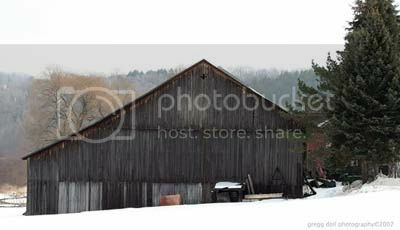 A barn sitting along the road leading to Prince Gallitzin State Park. 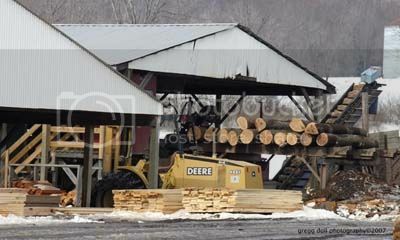 Logs at the G. W. Long Sawmill, outside of Patton on the road to Glendale Lake, wait for their turn at the debarker before heading into the sawyer. Rough finished boards lay in the foreground. 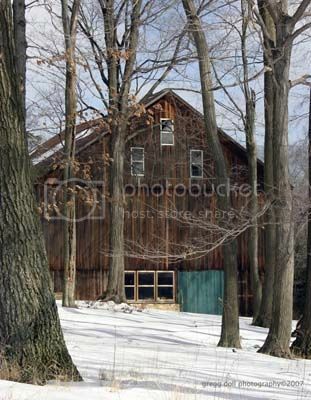 In almost thirty years of going to Glendale Lake, this is the first photograph I've taken of this barn. The barn, and the house next to it, are inside the park limits and provide housing for the State Park Rangers. 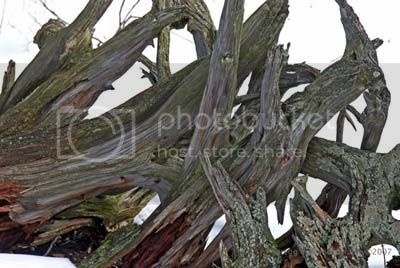 Tree stumps nestled together to make a fence line. 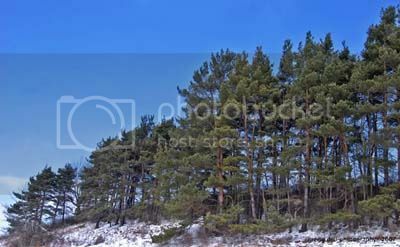 Standing out against the blue sky is this line of pines on Headache Hill, Prince Gallitzin State Park. Look close, there are over forty deer in this picture. 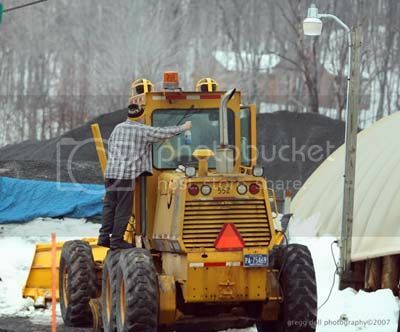 I'm about 1/2 mile away using a 300 mm lens. There are about 15 to 20 more deer in this picture that can't be seen. 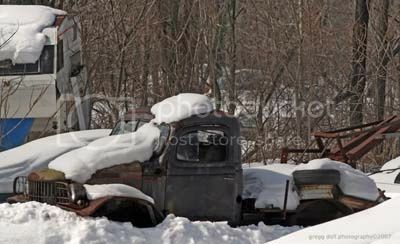 An old wrecked wrecker rusting away on Route 36 near St. Boniface. 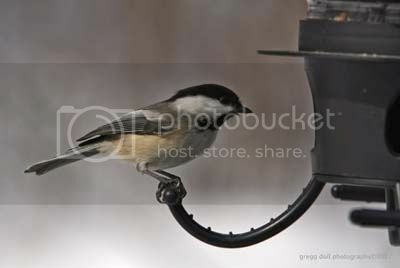 Trying to get one more sun flower seed out of the feeder is a Black-Capped Chickadee. I'm six feet from the bird with a 200 mm lens. 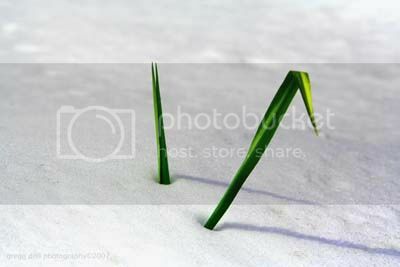 The green is Spanish Yucca, the white is snow. The form is a bird. 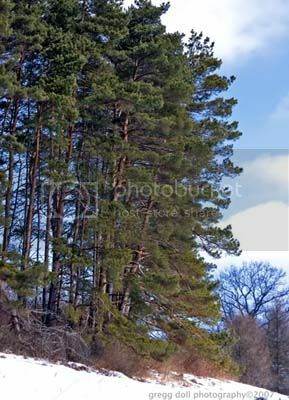 This week's blog is at an end.